JAMES B. WOOD.— The Nobility of the 'Election' of Bayeux, 1463-1666. Continuity through Change . BOB SCRIBNER and GERHARD BENECKE, eds. — The German Peasant War of 1525 — New Viewpoints. | ROBERT H. LUTZ. — Wer war der gemeine Mann? Der dritte Stand in der Krise des Spätmittelalters. DESMOND MORTON with TERRY COPP. —Working People : An Illustrated History of Canadian Labour. MARK THOMAS CONNELLY. — The Response to Prostitution in the Progressive Era. MICHIEL HORN. 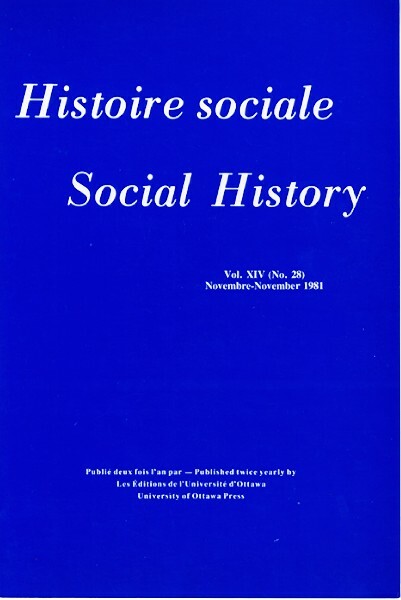 — The League for Social Reconstruction: Intellectual Origins of the Democratic Left in Canada, 1930-1942. JOY PARR. — Labouring Children: British Immigrant Apprentices to Canada, 1869-1924. GEOFFREY BILSON. — A Darkened House: Cholera in Nineteenth-Century Canada. GEOFFREY BEST. — Humanity in Warfare. THEODOR SCHIEDER and OTTO DANN, eds. — Nationale Bewegung und soziale Organisation. MICHAEL IGNATIEFF. — A Just Measure of Pain: The Penitentiary in the Industrial Revolution, 1750-1850. R. A. LEESON. — Travelling Brothers. JOHN MCCALLUM. — Unequal Beginnings: Agriculture and Economic Development in Quebec and Ontario until 1870. CHRISTOPHER R. FRIEDRICHS. — Urban Society in an Age of War: Nordlingen, 1580-1720. HUBERT CHARBONNEAU et André LAROSE, éd. — Les grandes mortalités: étude méthodologique des crises démographiques du passé. RICHARD PRICE. — Masters, Unions and Men: Work control in building and the rise of labour, 1830-1914. | PATRICK JOYCE. — Work, Society & Politics: The Culture of the Factory in Later Victorian England. JOHN BREWER and JOHN STYLES, eds. — An Ungovernable People. The English and their law in the seventeenth and eighteenth centuries. FRANZ IRSIGLER. — Die wirtschaftliche Stellung der Stadt Köln im 14. und 15. Jahrhundert. D. M. PALLISER. — Tudor York. | CHARLES PHYTHIAN-ADAMS. — Desolation of a City. Coventry and the Urban Crisis of the Late Middle Ages. MICHAEL CRATON, ed. — Roots and Branches: Current Directions in Slave Studies.